Tell us about your upcoming event. Click here to email your news releases and photos and we will list them on this page. Please send listings at least three weeks before your event. You can also tell us about your event in the comments section at the bottom of this page. 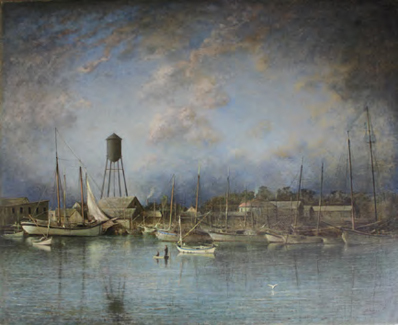 George Inness, Jr., American, 1853-1926 Tarpon Springs Port, undated, Oil on canvas, 26 ¼ x 32 1/8 in., On loan from the collection of Cici and Hyatt Brown, through the Museum of Arts and Sciences, Daytona Beach. July 11 - Aug. 20 - Art Deco Inspired Art Show - Artists include Liz Atlan, Gary Dean Mercer Clark, Ruben Consa, Eleazar Delgado, Mary Beth Koeth, Keith Mosier and Andy Sweet. Through Aug. 31 - An Arts Legacy: George Inness Jr. - Landscapes from the early 20th century, painted while the artist spent winters in Tarpon Springs for 25 years before his death. Leepa-Rattner Museum of Art, 600 Klosterman Road, on the Tarpon Springs campus of St. Petersburg College. Also on view are "Historic Tarpon Springs" and "The Legacy Continues." Hours are 10 a.m. to 5 p.m. Tuesday, Wednesday and Saturday, 10 a.m. to 8 p.m. Thursday, 10 a.m. to 4 p.m. Friday and 1 to 5 p.m. Sunday. Docent tours at 2 p.m. Sunday. Admission is $6 for adults, $5 for seniors and free for children, students and military families. Free admission Sunday with a suggested donation of $5. More info: spcollege.edu/museum or (727) 712-5762. Through August 29 - Coffee: The World in Your Cup - History of coffee production and consumption. Exhibit that tells the story of one of the world’s most widely traded commodities and how it has affected cultures, economies, and environments across the globe. South Florida Museum, 201 10th Street West, Bradenton. More info: 941-746-4131 or click here. Through July 6 - "The French in Florida" - New exhibit celebrating 450th anniversary of Fort Caroline now open at Jacksonville's Museum of Science & History. Features 42 digital reproductions from the State Archives of Florida of the French's attempt to establish a settlement in Florida beginning in 1562 with the arrival of the French Hugunots. 1025 Museum Cir., Jacksonville. More info: themosh.org or call 904-396-MOSH. 150th Anniversary of the steamship Maple Leaf - Presented by Mandarin Museum & Historical Society (Jacksonville). This Union troop transport sank in the St. Johns River at Mandarin Point after hitting a Confederate torpedo on April 1, 1864. Over 100 Civil War artifacts from the shipwreck are on loan from the Florida Department of State, Division of Historical Resources for this exhibit. The out of print book "Maple Leaf - An Extraordinary American Civil War Shipwreck" (Keith V. Holland et.al) has been reprinted by the Mandarin Museum as a 150th Anniversary edition and is available at the museum bookstore. Dr. Holland and other divers from the St. Johns Archaeological Expeditions Inc. will be present on select Saturdays and Sundays. 11964 Mandarin Road, Jacksonville. For more information and event schedules, go to www.mandarinmuseum.net or call 904 268-0784. Permanent Exhibit - Tropical Dreams: A People's History of South Florida - Tropical Dreams explores South Florida history from prehistoric times to the present day. Topics explored include First Arrivals, International Rivalry, Southward Expansion, New People - New Technology, and Gateway of the Americas. HistoryMiami, 101 W. Flagler St., Miami, FL 33130. For museum hours and other info, call (305) 375-1492 or go to www.historymiami.org. 14 - Native American Medicinal Plants - Free lecture by Michele Williams, Director for the Southeastern and Southwest Regions of Florida Public Archaeology Network at Florida Atlantic University, 6 to 7 p.m. at the New River Inn Museum (231 SW 2 Ave, Fort Lauderdale). Presented by Fort Lauderdale Historical Society. RSVP required: email education@flhc.org or call (954) 463-4431 ext. 16.